The first outfit is from July 19th, Saturday. We went to do a spot of shopping and I bought most of the second outfit. But let’s not get ahead of ourselves, so, this outfit is really simple but has some nice elements to it and it’s pretty much my favorite of the bunch. 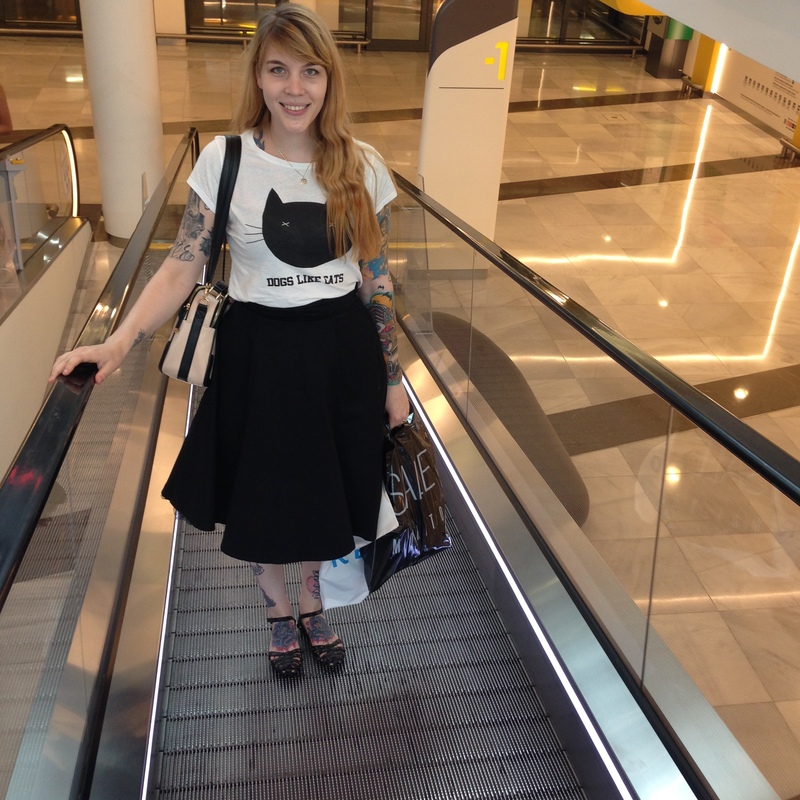 The skirt is from H&M and it’s really old, my shirt is from Zara and it features a cat face and a slogan saying “Dogs like cats”, my bag is from New Look and I’ve blogged about it before here, here and here. Last but not least, the shoes are Park Lane and you’ve also seen them on the blog before (here) but I hadn’t posted a product photo. They’re just a simple pair of flat sandals but have some nice studded detailing going on. 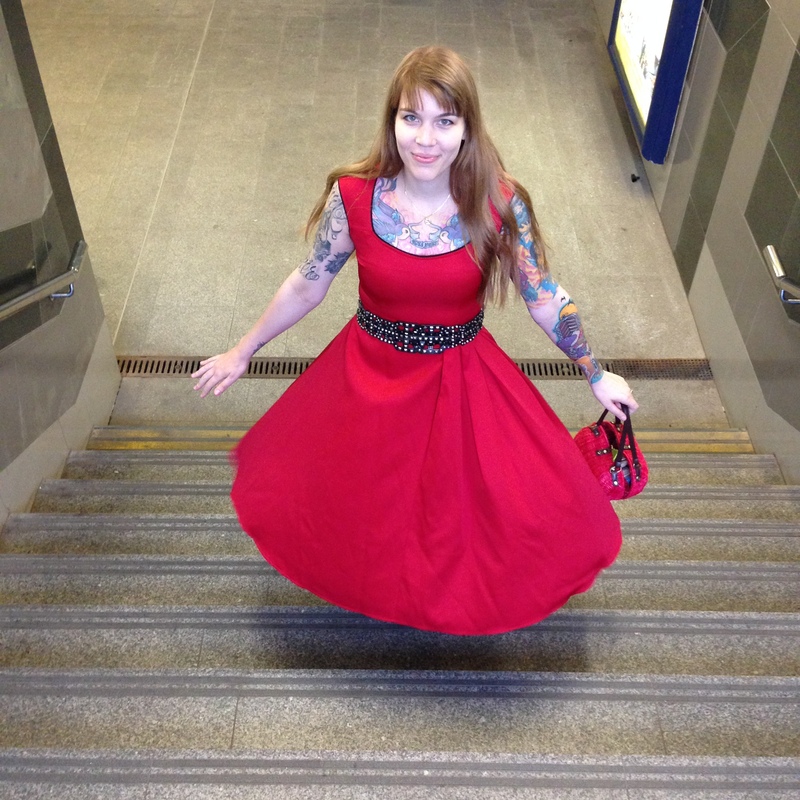 Oh and I was also wearing my petticoat under the skirt to give it a nice full shape. Outfit number 2: worn on the 20th of July, Sunday. We went to play beach volleyball with friends and this is what I changed into afterwards. I mentioned that this outfit is mainly the stuff I had bought the day before: a printed cropped t-shirt from Reserved, a pair of palazzo cropped trousers (I love that they look like they’re a skirt but as you can see in the first photo, they aren’t. I’ve always wanted a pair but I just wasn’t completely sure I’d wear them enough to justify a full-priced purchase and so I was really super happy to find them in the sales!) from Mohito. The shoes were also new and also from Mohito, I was eying them up on my previous visit to the store and was so happy to find them in the sale (half off) and in my size. My bag is from Ollie & Nic and I blogged about it here and here. I couldn’t find a product photo of the shoes so here’s a outfit photo were you can see them a bit better (this is an outfit I wore on the 21st of August to go pick up a gift for M). 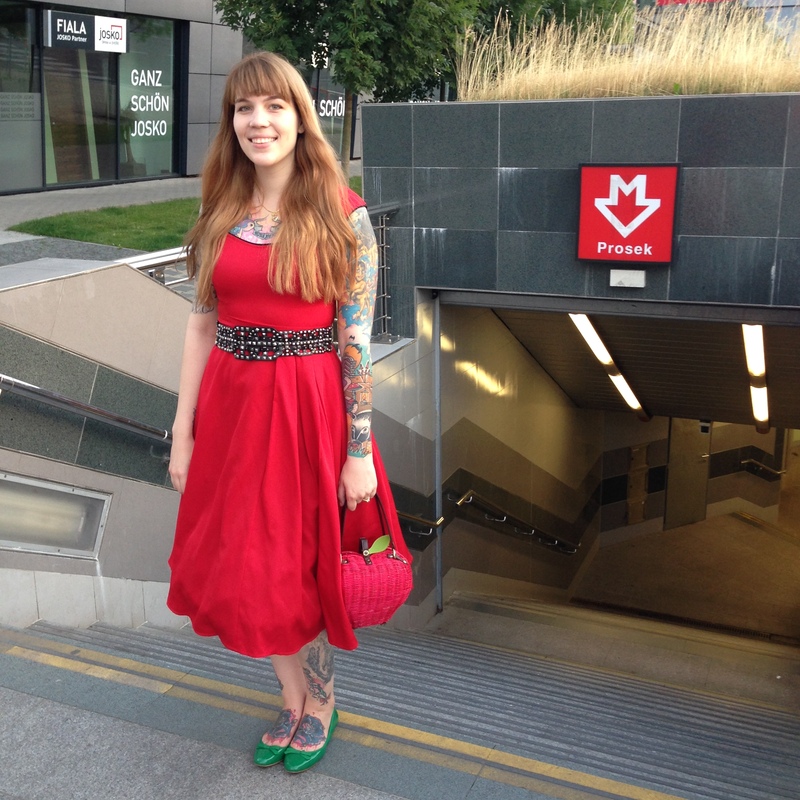 Btw, the dress is from H&M and it’s a tad too big so that lovely belt helps clinch it in nicely. 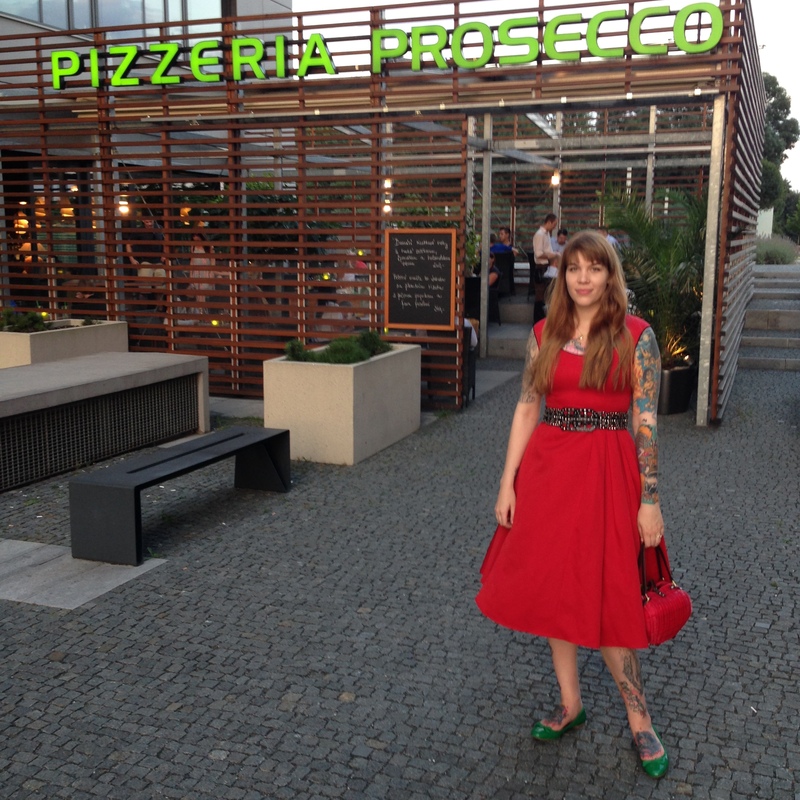 Outfit number 3: this was worn also on the 20th of July, but much earlier, out to lunch. 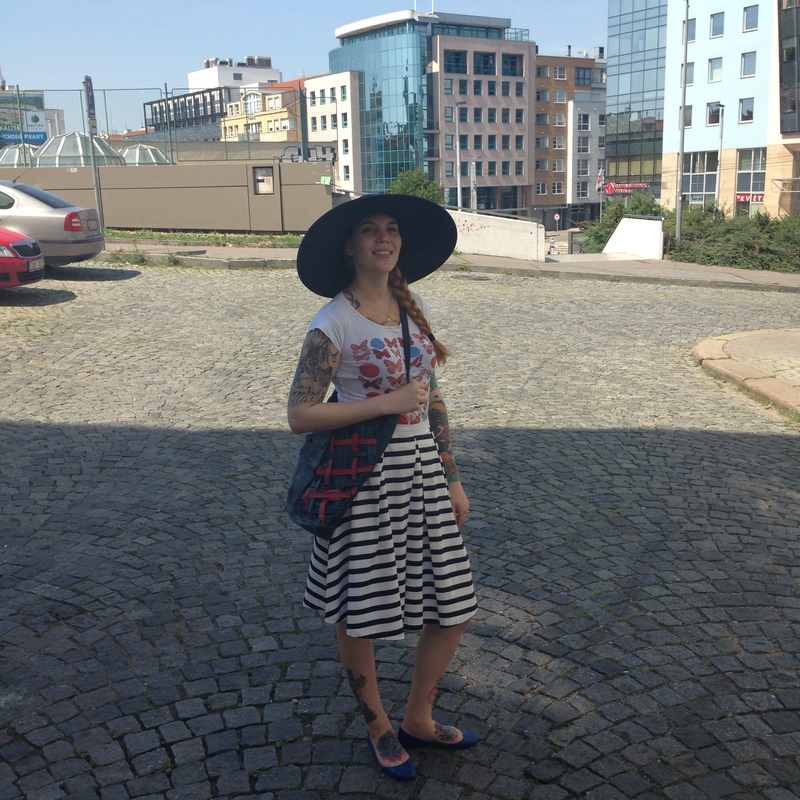 It also consists of a few things that I bought the day before – that hat (Reserved) and that skirt (Mohito). My bag is truly vintage as it belonged to my mother and she gave it to me ages ago. It’s really interesting with the red and blue weaving and is a good size to fit about everything one could think of. My t-shirt is from Zara and it has lots of pretty butterflies on it. 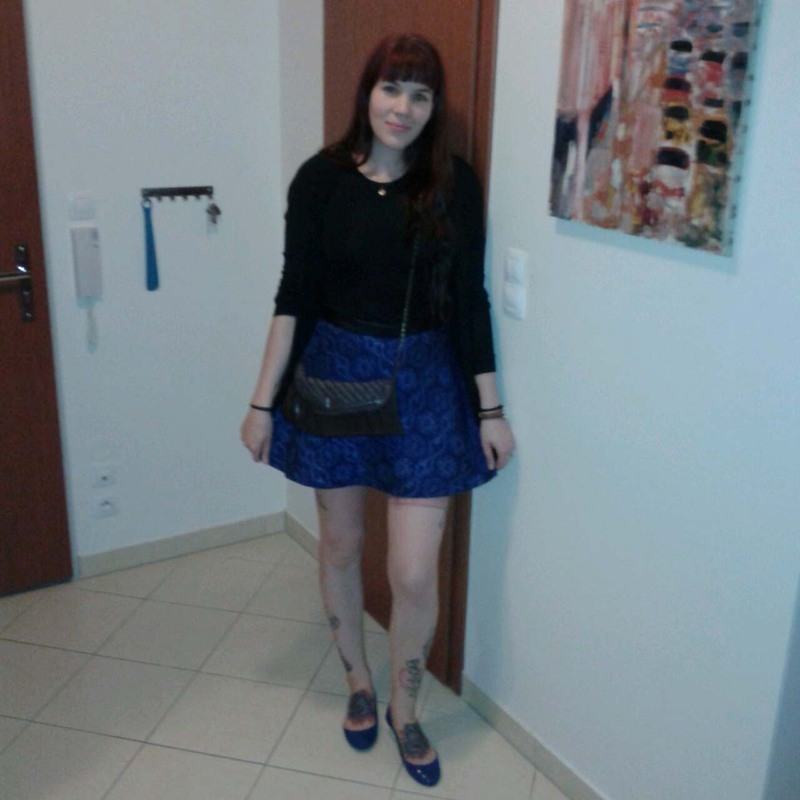 Oh and my shoes are also old and they are from Bershka and have a lovely blue color and texture (fake snake skin). I don’t have a product photo of the shoes but here’s a different outfit where I wore them and I love that skirt (Zara woman). I love the last photo because it looks like I’m levitating. Anyways, these were four outfits from July 2014 that I hadn’t blogged about until now and I hope you enjoyed them. See you soon. Bya. The red dress looks great on, but I’m sorry it’s crap quality. 😦 I heard they’ve shut down now. You look fab in it regardless! Thanks 🙂 That bag is definitely a favorite!